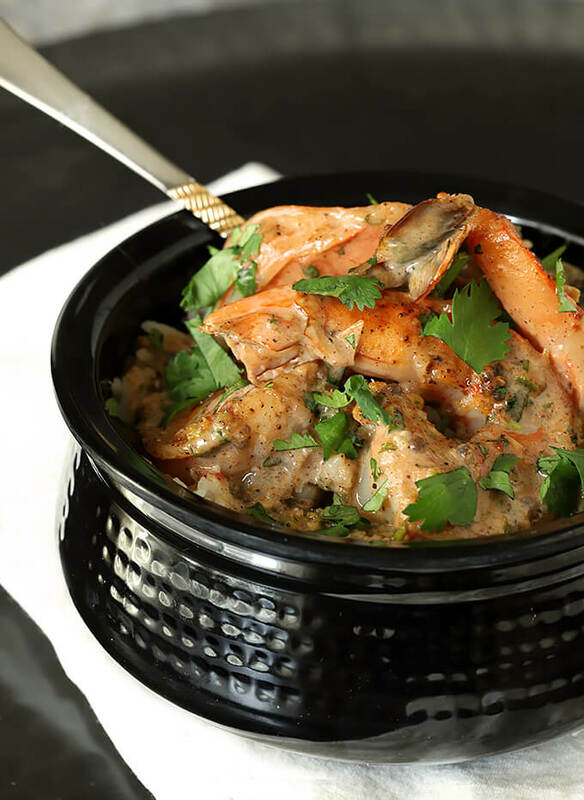 If you think Indian food is too complicated to make; then you need to try this Indian Stir Fried Shrimp in Tomato Cream Sauce (Bhagari Jhinga). Easy and delicious and such a delight to the senses! 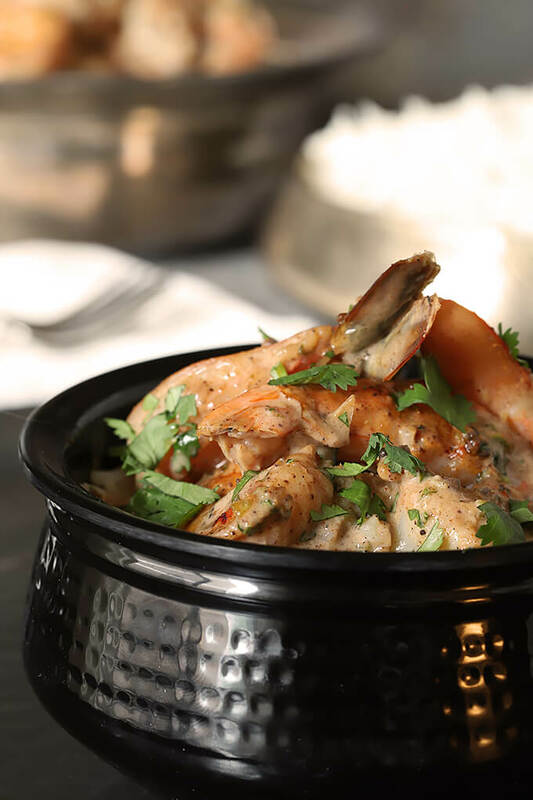 For the vast majority of my life, forays into Indian food meant finding a mall type restaurant, meeting friends and digging in at lunch to a buffet of popular Indian foods. I have to admit; the experience and the foods were novel enough I always enjoyed the experience and I probably still would today, but not quite like I used to. What changed? Real deal Indian food happened. I met my friend Ansh many years ago when I started a local blogging group and she attended one of our gatherings. We met once a month at my home and everyone brought something to share so we usually had a nice assortment of appetizers and desserts to enjoy. Ansh arrived with a spicy chicken dish called Chicken 65 that she had ‘Americanized’ for our crew. For us it was the perfect blend of spicy, hot, and delicious but I’ll tell you; I’ve since had her ‘un-Americanized’ version at her house and oh boy…hot, hot, hot!! Yep, I think I’m fairly adventurous but compared to Ansh and my other Indian friends I’m still a total wuss! But it was love and I’ve been more inclined since then to try different things at home and I can tell you, those buffets really don’t have as much appeal anymore; the foods I’ve prepared on my own are so much better! A few months after moving into a new home in 2014 I met my neighbors Parul and Saurub, both from India. Having a friend next door who cooks primarily Indian food has brought me even more wonderful personal experiences with the real deal. Every now and then Parul will send her adorable daughter Arshiya over with a dish for me to try. One day last year it was Indian Dal Makhani and when I found it could be made in my new Instant Pot? Perfect! I loved this dish so much that I had it every night for dinner until it was gone. And then I sobbed a bit I believe. 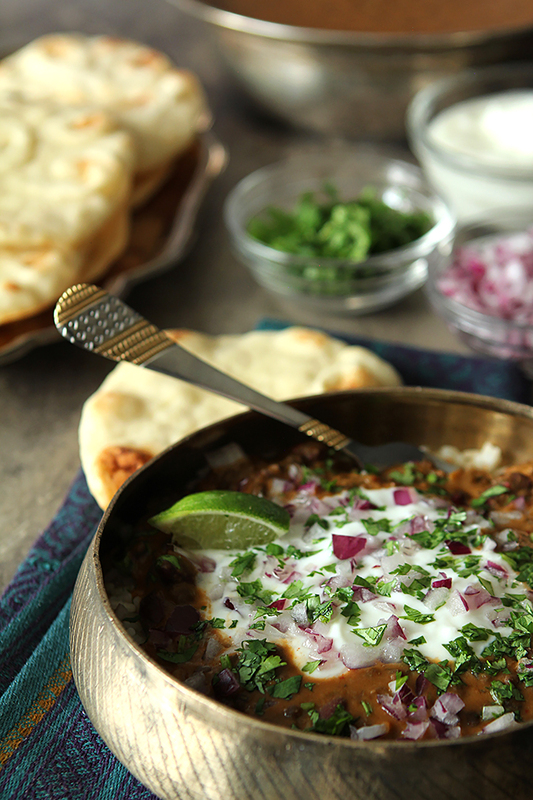 It’s a beautiful spicy dish filled with lentils, beans, chilis, garlic and more all cooled a bit with a topping of yogurt, red onion and cilantro and altogether it is just amazing. It should come as no surprise that one day I decided I needed to do more so I asked friends for some cookbook suggestions. They gave me some ideas, I bought a couple of books and the one I’ve really loved is Madhur Jaffrey’s ‘Quick and Easy Indian Cooking’ because well, quick and easy are sure appealing. Maybe the only thing about Indian cooking that makes it labor intensive is the search for spices. When I made the Dal; a number of the ingredients were only at local Indian markets which for me are a bit of a drive from my house. How lucky was I that my neighbor was heading that direction and put my list into her pocketbook and did the shopping for me? VERY lucky. But…you can buy almost anything you need online if finding a local resource is difficult. For this dish the only ingredient that might not be readily available is the Garam Masala spice; you should be able to source everything else at your grocery store, even coconut milk. I have to tell you, this was a fun shoot. Because my friends know what I do and how much I love setting up a ‘scene’ for my photos, they have both brought me props after their trips home. Ansh brought me the beautiful metal bowl I’ve shown rice in for this dish and is used for the Dal in the photo above from another post. Parul gifted me with some linens (I’ve also just recently made a chicken curry you’ll see those used in), and the black bowl and fork I’ve used for this Indian Stir Fried Shrimp in Tomato Cream Sauce. Goodwill did it’s share when I found one of my favorite pieces, the handled silver bowl in the background; yes, Made in India. It’s such a sweet gesture on their part and one I so appreciate; once I decide to make something authentic, it’s especially meaningful if I can serve it in authentic dishes too. Probably even makes it taste a bit better, right? This one is a true keeper. 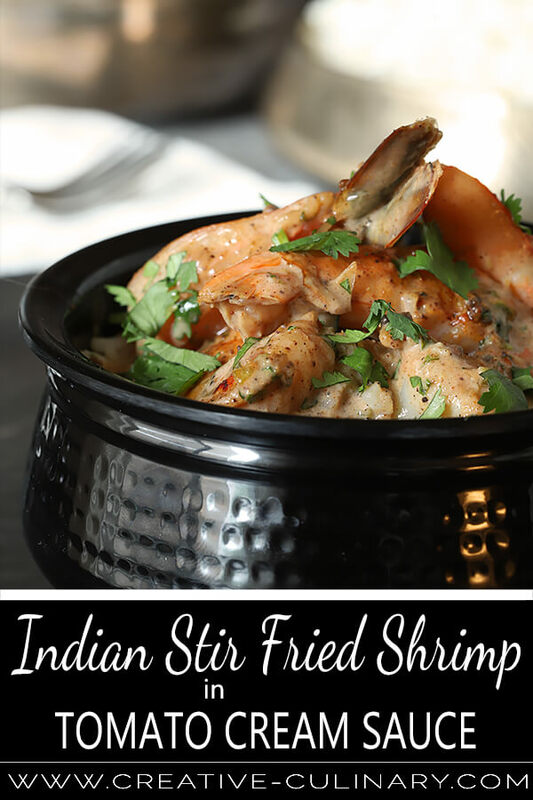 Have a craving for Indian food and want to surprise your family or guests? Do this; they will love you forever! Put the oil in a wok or frying pan and set over medium-high heat. When the oil is hot, put in the mustard seeds. As soon as the mustard seeds begin to pop--this takes just a few seconds--put in the garlic and fresh curry leaves, if using. Stir until the garlic turns medium brown and put in the shrimp. Stir until the shrimp turn opaque most of the way through. (I simply cooked mine until both sides were pink and they had curled). Add the sauce, turn the heat to medium, and heat the sauce through until it begins to simmer. 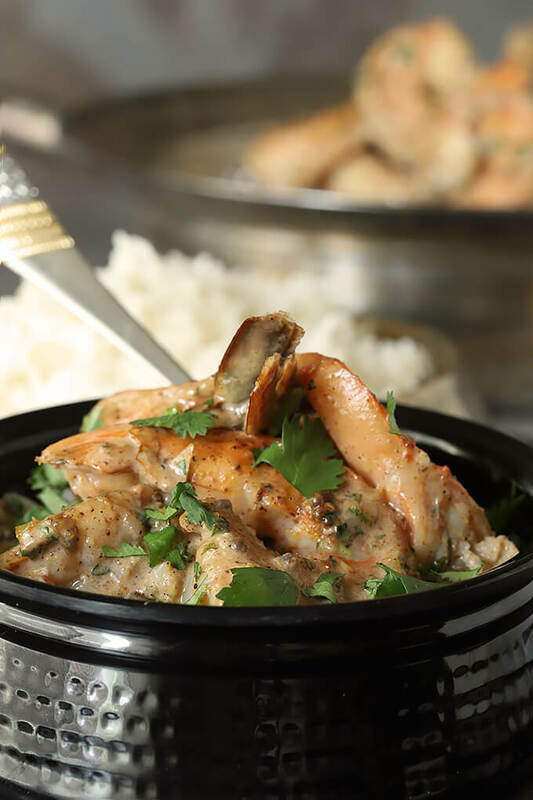 By then, the shrimp should be completely opaque and cooked through. Turn off the heat. Serve over rice (I used basmati that I had cooked with the remainder of the coconut milk from a 14 oz can). I did not have ground roasted cumin seeds; I just had ground cumin so I put it in a small skillet and heated it for about a minute. I only had yellow mustard seeds so I used them instead of the black. I only had a 14 oz container of coconut milk so I used it and used the remainder as part of the liquid to cook my rice for the dish. While I know where I can find curry leaves; it's a 2 hour round trip to an Indian market...so I did not use them and the dish was still fantastic. Highly recommend your blog to everyone. Especially this beautiful tomato cream sauce recipe really made our day. Made this for my kid’s tonight, they loved it. The taste is lovely and delicious. I loved that dish too Anna; I’m relatively new to Indian cooking and have been enjoying trying something new and maybe not so expected. Doggone I”m craving it now! Thank you for a beautiful tomato cream sauce recipe. Made this tonight for my family and the kitchen smells divine. It tastes even better. Isn’t it yummy. I love how good it tasted, especially since it came together so easily; glad you enjoyed it too! I actually still like those buffets, although it’s been years since I’ve been to one. Get to sample so many different things! I’m lucky — I’m a comfortable walk from a decent Indian restaurant that does a good buffet. Anyway, great looking dish! Nice for the fall weather that (I hope!!!!) is coming soon. Thanks.